Mr Vilas Tawde, MD & CEO of Essar Oil & Gas Exploration & Production Ltd (EOGEPL), was a keynote speaker at Gasification India 2018-Waste to Energy Conclave that was inaugurated in New Delhi on 29 November 2018. The two-day conference also features an exhibition where EOGEPL has put up a stall to showcase its leadership in the country’s unconventional energy space. 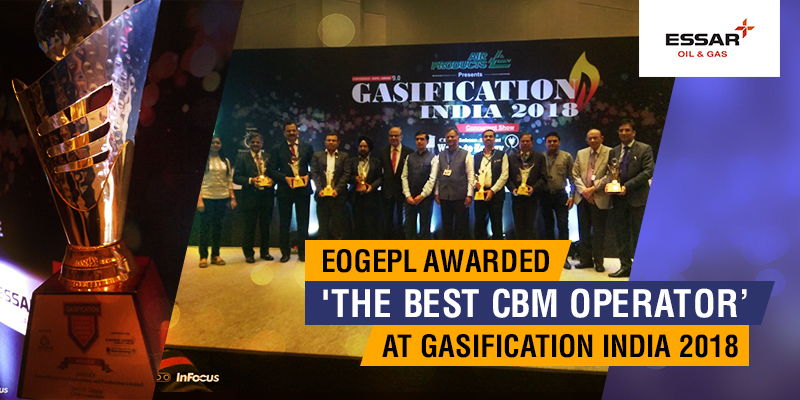 At the event, EOGEPL was also honoured with ‘The Best CBM Operator’ award for developing CBM-Raniganj Block as a showcase of ‘Truly Sustainable Project’. EOGEPL has commenced supplies of CBM gas from the Raniganj East block to GAIL in accordance with a 15-year supply contract that it recently signed with the PSU for offtake of its entire production from the block. Over the next couple of years, EOGEPL plans to drill a few exploratory and horizontal shale test wells in the block, where it has found very promising shale potential of 8 TCF, at an expected budget of $30 million. If these test wells are successful, the total investment, including post development and production, will be to the tune of $1 billion.